Homemaker Highlights: Do you like to Ebay? Do you like to Ebay? 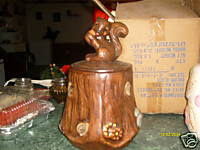 The Christmas present budget we set aside is already gone...Otherwise, this squirrel would be settling into his new home on my kitchen counter:) I love ebay and love the deals I find on there.